This week, I did something that I’ve never done before….TWiCE! I diced, chopped, minced and poured to make two of the best tasting soups I’ve ever had, all from SCRATCH! No dumping out of a can. No powders. No dried noodles. Just fresh ingredients, my stockpot and my wooden spoon. But I didn’t embark on this adventure alone. 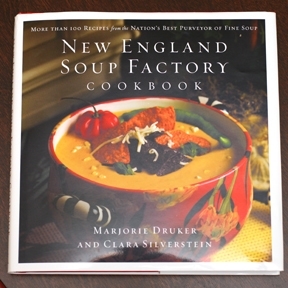 I had a guide in the form of the New England Soup Factory Cookbook, by New England Soup Factory Chef & Owner – Marjorie Druker. The New England Soup Factory opened in Brookline, Massachusetts almost 15 years ago, with husband and wife team Marjorie Druker and Paul Brophy at the helm. Since opening the restaurant has won numerous awards and is a four-time Best of Boston winner. In her latest recipe book, Chef Druker shares over 100 over her delectable soup recipes. The New England Soup Factory Cookbook is a hardcover recipe book filled with little anecdotes, pictures, helpful tips, and tons of personality. Just like a good house must have a good foundation, a good soup must start with a good stock – and that’s exactly where the cookbook begins, with simple and clear directions on how to make Chicken, Lobster, Beef, Fish and Vegetable Stocks. After stocks, you can peruse the other recipes, which are organized by flavors and seasons. There are even a couple of chapters covering sandwiches and salads. Many of the recipes also include really lovely photographs of the final soup product. At the end of the cookbook is a very logical index that helps you to find the recipes by name or by ingredient. And now, here is proof that I actually cooked soup from scratch! First up, laying the foundation, aka making Clear and Rich Chicken Stock. The chicken stock was pretty straight-forward to make. 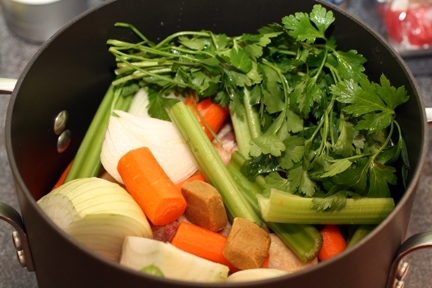 Add chicken, onions, celery, carrots, parsley, bay leaves, chicken bouillon, water and salt to a big stock pot and let simmer for a couple of hours. Once I put all of the ingredients into the pot, I took a picture because I thought it looks so pretty. Tip: I cut my recipe in half because I didn’t need to make so much (plus I didn’t have a big enough pot.) Make sure to cut back on the simmering time too, which I forgot to do and ended up needing to revive the stock with a little extra water. Now that I had my chicken stock, it was time to make my first soup. I flipped through the cookbook a couple of times and I kept landing on Cheddar-Corn Chowder with Bacon and Scallions. Chef Druker includes in her notes that her customers sometimes order a dozen bowls of this soup at a time to feed the whole office. 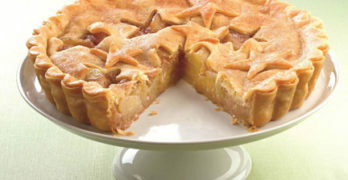 All of the recipes include a few extra lines from the chef explaining the logic behind the ingredients or sharing some other fun information about the recipe. 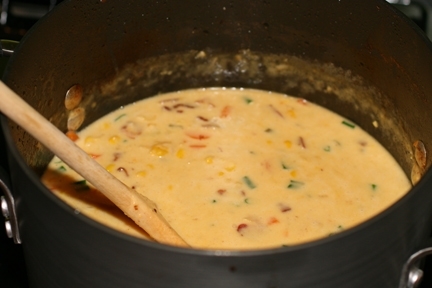 The Cheddar-Corn Chowder with Bacon and Scallions is absolutely amazing! I tasted it through the entire cooking process (about 40 minutes) and kept going, “YUM!” or “Oh my gosh!” out loud. At least the cats were around so I wasn’t talking to myself. 😉 This chowder has a great blend of ingredients and makes you feel like you’re getting a perfectly balanced meal that is filling but not heavy. The texture is creamy and smooth with nice little bursts of crunchiness from the bacon and the scallions. The soup has a subtle sweetness from the corn with a nice cheese flavor that’s in the background without overpowering the other flavors. Made with carrots, celery, onions, potatoes, chicken stock, two types of corn, cream, cheese & a couple other seasonings, the Cheddar-Corn Chowder was the perfect soup to eat during these past few cold winter days. It even re-heats well in the microwave, which allowed me to enjoy the soup for lunch at work. I gave some of the extra soup to one of my other testers and he said, “It’s like your mouth goes on it’s favorite roller coaster ride with every spoonful.” If you get this book, definitely make this soup. Tip: The next time I make this soup, I will add more bacon. Finally, tonight I made Chinese Hot and Sour Soup. I took a few liberties with this recipe mostly because I’m a picky eater. It called for a couple of different mushrooms, lily buds, and red chili paste, all of which I omitted. Yes, I know by cutting out the chili paste, I’m basically getting rid of the “Hot” part of the “Hot and Sour Soup”, but I’m a spicy novice and can’t handle too much heat. 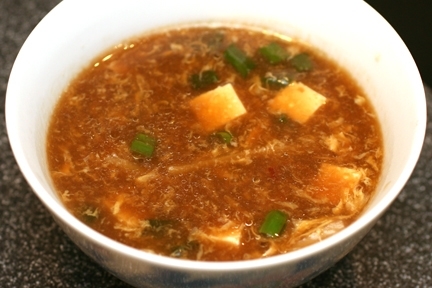 The Chinese Hot and Sour Soup was very easy to cook. 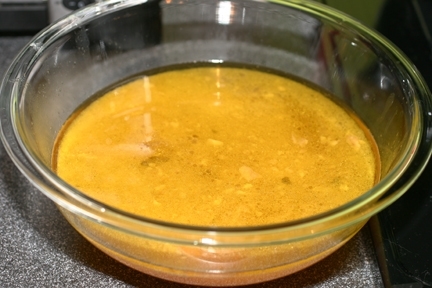 Heat up the chicken stock (or broth), add the ingredients, and let cook for a minute. I thought both of these soups were so good that I wouldn’t have believed I cooked them myself if I didn’t have the dirty dishes to prove it. The New England Soup Factory Cookbook is a great cookbook that will help you bring restaurant quality, gourmet soups into the comfort of your own home. The cooking instructions are very clear and easy to follow, and the pictures with some of the soups can give ideas on how to present your creations. If you like soup – get this cookbook. If you live in a place that get cold – get this cookbook. If you have a kitchen – get this cookbook. You (and your stomach) won’t be sorry. The New England Soup Factory Cookbook is available for purchase online from Amazon.com, where it incidentally has a 5-star rating (and I’m not surprised.) A big thank you to Chef Marjorie Druker for sharing her delicious recipes to those of use who don’t live in the Boston area! I definitely plan on stopping by the restaurant the next time I’m in the Boston area. Disclaimer: This post consists of my (and/or fellow tester) opinions and experiences only. Yours may be different. No compensation was given for this review/giveaway. I received a free copy of the New England Soup Factory Cookbook from the manufacturer or their representing PR agency to use and test for the purposes of this review. This did not affect the outcome of this review. Wow, thank for this review. I love making soup and my daughter has just started. This cookbook would be perfect for both of us. I loved your pictures. I just put this book on my TBL. I love soups of all variety and I’ve been trying to figure out how to make a certain soup that I love (which I unfortunately have to buy from the store). I’d love to invest in a quality soup recipe book so I can learn how to make that soup I’m wishing to make, or at least learn common ingredients and soup making techniques so that I can use the approach to figure out myself how to make any soup I want. Thanks for the review! I’ll look out for the New England Soup Factory recipe book!